Since CentrePointe was initially proposed over three years ago, the project has been marked by fantastical bluster, broken promises, poor designs, and, ultimately, a failure to build. All of which was compounded by the developers’ riteously indignant, arrogant, and combative attitude when challenged on the wisdom of CentrePointe. Create a vibrant destination which attracts residents, workers, and tourists. Make that destination a distinctive place which no other city has. Create public and private spaces within the destination. Balance the types of uses within the development. Ensure local businesses have significant presence. Ensure that the space is well-integrated with the surrounding community. After three years of apparent tone-deafness by CentrePointe’s developers, the prospects for such a “signature place” seemed quite dim. On the sweltering third floor of the old courthouse yesterday, an overflow crowd of some 300 Lexingtonians received a tantalizing glimpse of a new approach to the CentrePointe project. And that approach represented an enormous (and refreshing) step in the right direction. With the encouragement of Lexington’s new mayor, the developers engaged Jeanne Gang of Chicago’s Studio Gang Architects (SGA) to rethink the CentrePointe block. On Thursday, she present preliminary site design concepts for the CentrePointe block. And she presented a marked departure from the old approach to CentrePointe. Design. SGA abandons the “Fortress Lexington” approach of the old CentrePointe. By breaking the project into independent components with different volumes and designs, SGA will avoid the imposing and monolithic designs offered in previous iterations of CentrePointe. Openness. By showing preliminary design concepts and inviting public input on them, CentrePointe promises to be a much more open project. The developers are even inviting local architects to design the Main Street components of the project. Humility. Gang showed her work and her thinking while it was still in progress, while it was still incomplete. Exposing this level of uncertainty takes a striking degree of humility and confidence – for both the architect and the developer. Whereas previous iterations of CentrePointe were presented as a fait accompli to be adored by a passive audience, SGA’s version promises to be a shared community treasure which we might be able to design together. In this more humble regime, once-adversarial relationships might transform into more-cooperative ones. The mayor and the developers and SGA are to be commended for crafting this new approach to CentrePointe. The chances for creating a unique, signature place for Lexington went way up yesterday. And the developers deserve some credit for allowing that to happen. Despite the new approach to designing CentrePointe, a number of nagging issues remain for the tortuous project. While Gang’s site design breaks up the monolithic tower of previous CentrePointe concepts, it appears to maintain the overall square footage and volume of the last iteration of the project. If the project is roughly the same size, it should be roughly the same cost – around $200 million. And if the developers have had difficulty lining up financing for the past three years, what will allow them to line it up now? The commercial real estate market remains deeply depressed, and it isn’t clear that such abundant premium space would find tenants in Lexington. The business model issues we identified early in the project haven’t fundamentally changed. Is it possible that the new design will be so revolutionary, so inspirational, so great that investors and tenants will line up around the CentrePointe block to get in? Perhaps. We’d be thrilled. But we doubt it. The $200 million price tag is also important because that is the minimum required to qualify for tax increment financing (TIF). TIF allows cities and states to allocate future incremental tax revenues to finance today’s public improvements related to new economic development initiatives. In CentrePointe’s case, the city and state would finance about $50 million in improvements – a parking garage, sidewalks, storm sewers, etc. – around the project, and they would hope to recoup that investment from new taxes generated by CentrePointe. In previous analysis, we’ve found that the CentrePointe TIF is highly problematic, and that it is doubtful that the city or state would ever get their money back. Even though the new design direction is encouraging, several other aspects of the project are still unresolved. Is the project the appropriate scale for Lexington? Can it find willing tenants? Can the developers nail down financing? Is the TIF worth the up-front expense? The developers find themselves in a dilemma: If their project falls below the $200 million mark, it will be much more realistic to finance and to find occupants. But it will lose the $50 million boost from TIF financing. If the project comes in over $200 million, it is much more difficult to finance and occupy, and the opportunity for financing the project in the next 5 to 6 years looks grim. (The TIF agreement between the Kentucky Economic Development Finance Authority and the city specifies that the $200 million be spent by January 2015). We applaud the developers’ new, more-open approach to designing CentrePointe. Bringing Jeanne Gang and SGA in to rethink the site is a welcome departure from the past three years. As frequent critics of CentrePointe and its developers, we’re very encouraged by the new direction of the project. But because the economic challenges to the project linger on, we’d like to see a more open, more flexible approach applied to the execution of the project as well. Perhaps the project could be built progressively or in stages, to allow for further construction as new financing becomes available. Perhaps it could be downsized to multiply financing options. If – and this is a big ‘if’ – the developers can rethink their business model the way they’ve begun to rethink the design, the future of CentrePointe may be bright indeed. UPDATE 6/6/2011: Graham Pohl now has a fine post up on an architect’s perspective of the new CentrePointe design and process over at ProgressLex. I am not an architect but I have seen far too much bad advice come to Lexington, remembering the loss of Union Station, the devastating downtown “urban renewal, even the Festival Market mistake and so much sterile development. 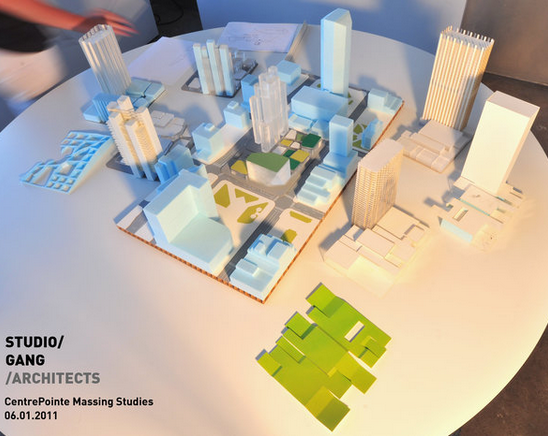 While I compliment the Webb’s for opening up the discussion of Centre point property to the public and having Jeanne Gang and SGA, the architectural firm from Chicago, I share some random thoughts from listening to the presentation. 1) When I think of seriously inviting places, especially in big city parks, I remember primarily women with strollers. Small play areas for older tots while the parents sat with infants really encourage the feeling of being amongst a friendly group. 2) Avoid self contained buildings that discourage the visitors or employees from leaving the building during their being there in those buildings. We need people on the streets. Jeanne Gang ideas of “horse country” divisions of the structures may also lead to security issues and lots of dead or inactive space between buildings. 3) Jeanne Gang mentioning Cincinnati in her presentation brings back the memories of hundreds on Cincinnati streets, many residents of the downtown, going to street front businesses that even bring business building workers out to eat and shop. 4) These wonderful ideas need financing. Are we encouraging local ownership with local financing in addition to seeking local architectural input for buildings on Main? 5) Can we begin thinking about diverse residents living downtown? What about cooperation with the university, and their donors, for housing to bring older student, faculty, staff and maybe retirees to such structures? 6) This project should not be used to promote changes from one way streets – Main or Vine. It’s another issue totally and shouldn’t be planned for Dudley’s main structures on Vine. Ironically, how many one way streets in Spain, Austria or NYC did the presenter use as beautiful streets? 7) The old Vine redesign used in slides is a ridiculous rendering, especially in scale for that area. 8) Division of space usage? Store fronts, office, hotel, condos or apartments? While financing/investment is completely unknown, before any development is approved, the communities’ creative thinking may bring the best ideas forward!